This morning I ran out of gas on the way to preschool. Today I learned that my prius will shut down the engine and then has the ability to putter along on battery power for a while before dying completely. Half a mile short of the gas station. With two kids in the car. Or, as Ben put it: “two starving kids”. I scrounged a pack of Halloween smarties from the bottom of my purse and he happily munched away while we waited for backup. Candy at 9 am? Why yes. My awesome mama came to the rescue with a jerry can of petrol and we happily went on our way. Goes to show that even when you’re an adult with kids of your own those mamas are still looking out for you. Or as Ben has been saying lately: “She’s a super mama! !” Yes she is. The day is looking up, however. Ben had an awesome day at preschool and we’re getting together with a good pal tomorrow for a long-overdue adventure. This afternoon Ben and I are going to make some Thanksgiving place cards for our shindig next week. The time the Columbia River froze. My Nana used to talk about ice skating one year on Lake Washington but I never really believed her. Maybe I should have. Made me laugh. Introverts Unite! Bullying is ageless: conflict and violence in nursing homes. I believe it. Especially as my grandfather became known for the incident in which he dumped a glass of milk on his dining companion’s head. We’re in the midst of finishing up the laundry room. 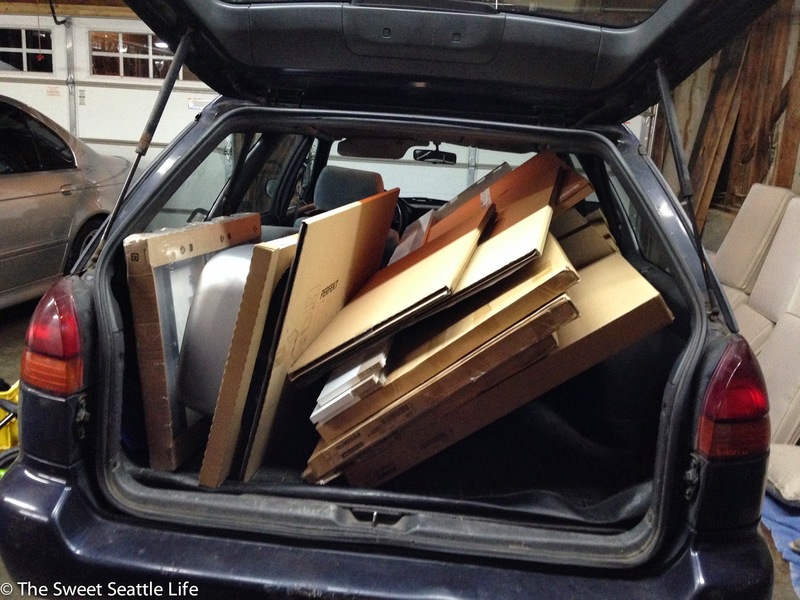 Check out my packing job from a trip to Ikea last week. What you can’t see: Little Em, hidden away in her car seat. Ikea jenga at its finest! Have a great (almost) weekend! Dumped milk on a companion's head?! Yeah, he became pretty cranky in old age. [Dammit, I wanted CHOCOLATE milk!]. They give you a little latitude when you’re 100 but we moved him to the dementia ward shortly after.